The young cleric excuses himself: it is time for Friday prayers. Padding across the marble floor in his socks, he plugs in a crackly speaker, and issues a droning call that rings out across the village. A madrasa student shoos a stray goat out of the mosque courtyard. Villagers wrapped in wool blankets shuffle in. Judging by the sermon it is not Christianity that was preoccupying Saalim this Friday. For 30 minutes he rails against the evils of drinking, gambling, kite flying, pigeon-racing, cards and, oddly enough, insurance. “All of these are the work of the devil,” he says, before launching into a fresh recitation. Saalim was born in 1979, just as General Zia ul-Haq, the dictator many blame for Pakistan’s radicalising wave, was hitting his stride. Saalim reflects the influences of his generation. He hails from Bahawalnagar, close to Zia’s home. 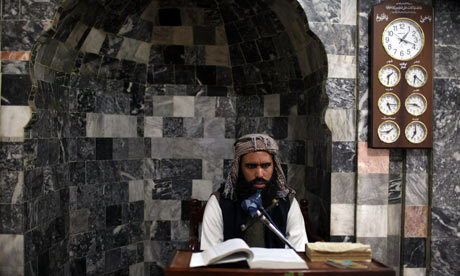 He studied for eight years in Pakistan’s “madrasa belt”, close to the city of Multan. Now he is imparting his learning to another 150 students in his own madrasa, which follows the strict Deobandi tradition. “It is the way of God,” he says. This entry was posted on Friday, January 14th, 2011 at 01:03	and is filed under Uncategorized. You can follow any responses to this entry through the RSS 2.0 feed. Both comments and pings are currently closed.